Probiotics are living microbes or good bacteria that have been shown for many years to have health benefits to the gut. As more is known about them, they seem to be popping up everywhere in research as a viable treatment to help so many other health issues. Here are some unusual health benefits of probiotics that you may not have thought of looking into. I like to take a probiotic supplement every day in addition to eating fermented foods. I take this probiotic because it has many different strains and this way I get the optimum health benefits. I also try to eat a small serving of something fermented with each meal, like sauerkraut or fermented garlic. Looking for natural ways to treat anxiety is difficult because there are not many options. One simple easy thing you can try is taking probiotics. Research has found that there is a connection between the gut and your mental health. This is one unusual benefit of probiotics and most people don’t realize it because they think of anxiety as only related to the brain. Scientists have found that the bacteria in your gut may (be related to several mental health issues) have a link to autism, anxiety and schizophrenia. This is one of my favorite unusual health benefits of probiotics. You probably have heard those TV commercials touting the benefits of probiotics in yogurt and how most of your immune system is in your gut. Well, I prefer eating fermented foods like sauerkraut with my meals, instead of sugary yogurts, to get the benefits and boost my immune system. More research is being done on promising health benefits of probiotics but studies do show that these microorganisms benefit the immune system by calming your body’s inflammatory response and supporting activity in the immune system. Many say taking probiotics helps keep colds away and according to many health experts probiotics along with vitamin C, garlic, and vitamin D are good ways to combat a cold. Research has found that probiotics can help clear acne prone skin. What’s the reason for this? Recent studies have affirmed that there is a gut/skin connection. The problem is that our diets today often consist of processed foods and this along with significant stress in our daily lives, and the use antibiotics, often disrupts the delicate balance of microbes in our gut and increases inflammation of the skin. Taking more good bacteria helps calm the inflammation by offsetting the colonization of the bad bacteria and probiotics have also been found to reduce the production of sebum. Sebum is the oily secretion of the sebaceous glands and if this is excessive it can be responsible for not only oily skin but acne. You can take probiotics both internally and externally for your skin. Taking probiotics both ways, topically and orally, has been found by the American Academy of Dermatology to be a promising way to take action in healing and treating acne prone skin. 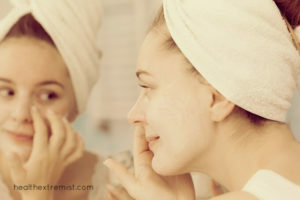 To apply it topically, try my simple probiotic face mask recipe. Take your probiotic every few hours. Having the stomach flu is just horrible, I’ve had it so many times as a child and get it occasionally as an adult! My mom used to say that there is nothing you can really do for it for the first several hours but wait it out. Trying probiotics is one thing you can do to try and shorten this misery! I was surprised to learn that this is one of the unusual health benefits of probiotics but, after trying it myself, it really worked. I’ve tried taking one every hour for three hours during my last mini stomach flu and I definitely think it helped me get over it faster. If you have the stomach flu it is recommended to treat it in three phases. First don’t eat or drink anything for three hours or more after you have thrown up. Second, when vomiting has subsided you can start sipping very small amounts of water. I usually try ice chips first at this stage of treatment. The third stage which helps you recover faster is to take a good probiotic supplement. How do you take them? It is optimal to take one probiotic supplement every hour until your symptoms improve. After continuing with the probiotics, most people get better in less than 24 hours. If you have depression it’s helpful to know that this is linked to gut problems. This is because there are neurons not only your brain, but your gut. Neurons produce serotonin, a neurotransmitter, which is actually found in the gastrointestinal tract. Some research has found that serotonin levels can affect mood and cause depression. Reduced levels of serotonin has also been found to have links to obsessive-compulsive disorder and anxiety. Other health problems that have been found to be connected to gut health include autism, ADHD, and schizophrenia. The gut/brain connection reinforces the importance of keeping a healthy balance and optimal amounts of good bacteria in the gut. Your nose is another place that needs friendly bacteria. Nasal cavities contain microorganisms and a healthy balance of flora is an optimal environment. Probiotics can help your nose as research has found people with chronic sinus problems show a reduced biodiversity in their nasal passages. Probiotics have been also been reported to help reduce your chances of developing allergies. If you have sinusitis it is often recommended to take lactobacillus acidophilus, which has been found to help fend off allergies by the University of Maryland Medical Center. Although I don’t think you can find anywhere that sells a probiotic spray you can inhale, yet. Taking a probiotic supplement can improve your gut health and research has found that this helps your sinuses. If you do want to try getting probiotics directly into the nasal passages you can try this remedy I came across online and either put the probiotics in a spray bottle with filtered water or add them to a neti-pot. Since the mouth is the entry way to your gut it seems to make sense that probiotics can improve your oral health too! This is another one of the great unusual health benefits of probiotics! There is a lot of scientific research that supports probiotics can improve breath, help treat gingivitis, gum disease, and tooth decay/cavities. Some of the research on probiotics for oral health has been done requiring subjects that eat yogurt or special probiotic lozenges. This way the probiotics are released directly in the mouth for optimum effect. This is why eating fermented foods may have the greatest benefit as your mouth comes in direct contact with the probiotics and they can more easily colonize the mouth. Are you surprised by some of these unusual health benefits of probiotics? Do you take a probiotic and/or eat fermented foods? I take Naturemade probiotic now. Do you recommend another? Also is one pill a day enough? Hi Michael, I’m not familiar with that probiotic. I take the one linked above in the post. Generally, probiotics with the more strains, the better. 🙂 I take one a day and then also try to eat fermented foods with each meal to help with digestion. I cannot emphasize the importance of including probiotics in the diet! But, if you are getting your probiotics from yogurt or any dairy, you may still end up with acne anyway. That’s because dairy stimulates the production of sebum. In addition, its not so much that processed foods cause acne as much as it is that processed foods invariably have dairy in them and its the dairy in the process foods causing the acne. Seriously! Got acne? Get rid of the dairy. Easier said than done. Fermenting vegetables is also an excellent way to include probiotics in the diet if those bottles of encapsulated probiotics are out of your price range. Homemade sauerkraut is awesome and a great first for learning to ferment veggies. very interesting post. I agree that probiotics are able to help a myriad of things as I myself have noticed improvement in my mood and skin since taking them. Possibly helping my immunity too as I haven’t gotten ill yet this season. I just made my first batch of yogurt. It was easy and delicious. So glad it turned out delicious!